Please see https://releases.xamarin.com/stable-release-15-3-2/ for the details about this release, including the steps to update or downgrade as needed. Please also see https://releases.xamarin.com/stable-release-15-3-2/ for a summary of fixes included in this release and remaining common issues from the Xamarin 15.3 release. This release is now available as part of Visual Studio 2017 version 15.3 and in the Stable updater channels for Visual Studio 2017 for Mac and Xamarin Tools for Visual Studio 2015. Please file a quick bug report using the "15.3 Release" new bug form if you see any suspicious behavior in these versions that you wish to report. Xamarin Tools for Visual Studio version 4.6.0 and higher require Visual Studio 2015 or higher. See the last section of the release notes for additional information. With latest Xamarin I see a strange change. this used to work fine before latest stable Android release. 4) The "new version notification" stopped showing up when opening a xamarin project. On VS2015, nothing happens after the install button is pressed. 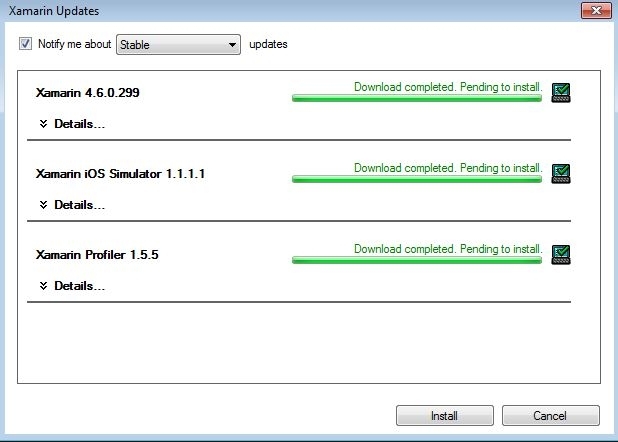 If I open the Xamarin Updates window again the list of "Pending to install" updates are still there. Please file a quick bug report using the "15.3 Release" new bug form. Thanks in advance!